Last August a trip back in time occurred. It didn't make the papers, Fox News or CNN. Five women met for a morning of remembering elementary school, how they survived 7th grade at the Nike Base. That year our moms banded together to stop the buses from crossing an unsafe bridge. We remembered our years at PHS. All of us lived in the same subdivision where streets were walked after dark, sleds sailed down snow laden streets and phone lines almost melted from many daily crisis situations. 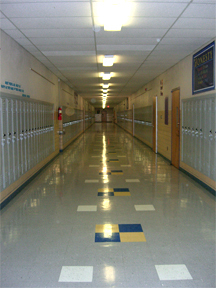 The hallway above was our high school it is now the middle school. Remembering the the feel of shoulder to shoulder walking, the smell of well perfumed girls because we didn't like the showers, and a smile beaming at you as you passed a friend (Robby!) seems as bright as the polished floors in the photo. Some of us have moved to other states, all have been married and have children but the moment we saw each other time turned backwards and in our hearts we were teenagers once more. Time had crept into the space between high school and living. The five of us had lost touch with each other, missing important milestones in each others lives. Then facebook brought us together again. It took almost a year before we found the last person, but it happened. Now, we fill in the blanks, know that we will be there for each other from now on, and rejoice in the remembering of our pasts. I wish everyone could find their early friends and do their own remembering. for more a2z check out Patty Wysong. I would have loved reading this story the papers, or seeing on Fox News or CNN. What a wonderful and fun story! Aw, memories are made of this! So fun and special, Diana! Must have been a wonderful get-together. So glad you had the chance! I wonder just how many people FB has brought together? That would be an awesome research project to do for someone with oodles of time on their hands, huH? :) Very cool about getting back together! So cool that you could get back together! What a treasure!! What a wonderful reunion! I'm so glad you were able to find all of your group from the past and get together again! For all the gripes and grumbles folks have about Facebook, I think stories like this one (and there are many) more than make up for its shortcomings! Cool story, Diana!